Where oh where does the analytical eye-pattern find love? These are those special, thinking types, who are sometimes great cubicle brainiacs (who might consider themselves to be socially awkward), or they can be incredible networkers and athletes. No matter what, they are the “thinking types” – those special individualss who live in their head, contemplating and thinking things over and over and over again. Of course, you can choose any kind of relationship you like, but the more similar the eye-pattern, the more similar the personalities (and sometimes a bit less spark). Therefore, if the eye below is attractive for you, it’s probably a good match for you. The amount of attraction you feel about it, would determine what kind of relationship it will be; best friends, wild lovers, or great supporters. Keep in mind, in this months series on love, we are assuming that each of these eye patterns are living their true personality – sometimes people shift from their inherent personality (in order to adjust to their environment) in their early years and that’s when relationships get more complicated; that blog is coming the end of this month. TIght weave of the white fibers (Holding in their passions). Personality can be very creative – in a structural format such as engineering or carpentry. They can build a race car that is a piece of art, as well as a precision performance vehicle. Often they have two distinct personalities – the one they present to the world – at work – at church – at school – and then the more playful, or passionate personality that comes out in a more private setting. They tend to have a more angular body – wider, flatter hips, and a flatter derriér. (See the couple at the top and how angular the woman’s forehead is? This is a telltale sign of those with the freckles in their eyes). People with eyes with the spotted patterns have a real need for freedom – to feel free to be themselves, to get away and indulge their fantasies (be it in computer, video games, book reading, going out, etc.). They need a few people around where they feel free and comfortable to be themselves. Now you can run and look in the mirror, or grab your iPhone – but be sure to visit https://irigenics.com/project/freebies/ to take your eye-selfie now so you can compare your eyes to the ones in this blog. Lots more open fibers – and the blue eye is a bit more extroverted than the freckled one above, which will help to bring out the networking and social side for our thinking type. This blue eye has one or two of the brown freckles so they can keep up with the sharp mental thinking of their partner above, especially when they get very cerebral. The blue eye has more flowery openings – someone who will draw them out – and open the playful side. 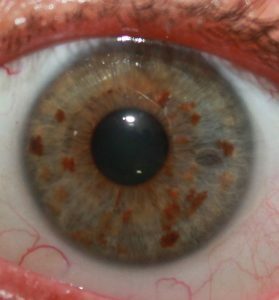 While the freckled individual may have more tendency to think-think-think — This blue eye is going to draw them into “experiencing” and feeling. This eye also has a ring of compassion, which allows them to be more sensitive to their thinking partner above. Because this blue eye is the more emotional pattern, they will need to learn to signal their thinking partner when they need a bit more attention. 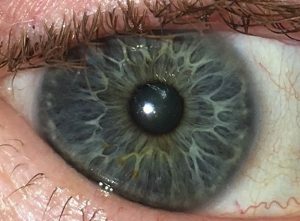 The blue eye, can need to be seen and heard, and the thinking eye above can get fairly concentrated on something, making the blue eye individual feel left out. The great news is that the thinking freckled type is very visual – give them a little cleavage or a little glimpse of something coming to life beneath your clothing, and you will swiftly and efficiently bring their attention back to you. Another clue.. those with the freckled eyes, love a back-rub. While everyone enjoys a bit of physical attention, a back rub moves mountains with the freckled eye pattern. They need the lymphatic stimulations since they live in their mind so much. If the freckled eye is really in a rut, it’s a good idea to take them on an adventure somewhere. Go see something new, or to a mind-engaging movie. Take a hike, a trip to the science museum, even the children’s science museum… they will appreciate the experience and that they shared it with you. Besides a back-rub, one of the greatest things you can do for the thinking type in the bedroom is a bit of blindfolding – it helps them to feel their body (since they are usually in their mind), and still feeds their mind with the fantasy part of not being able to see the lover who is giving them attention. You could have them close their eyes, and feed them a strawberry – that kind of taking life up-a-notch to an experiential, creative level will do wonders for you and your relationship with a person who has the freckle indicators in their eyes. Word of caution — if you’ve never played this way before, be sure to ask them what they would think about it first – let their mind open up to the idea. People with this many freckles, got them for a reason — and it usually had to do with a lot of rules and ideals — “I have to live this way… I’m supposed to act this way… ” so give them the opportunity to consider the idea and bring it back to you. They love when an idea is there own. and the blue eye to the right helps the freckled eye to get out of their head and into their body, and their heart. This pairing of eyes can both take on a bit of competitive nature so it would be important for them to make sure the competition is playful and sassy and not let the competition get out of hand! There would need to be clear lines in who has what roles in this relationship. Sometimes the blue, flowery eye could feel like our thinking eye at the top isn’t honoring or respecting their emotional feelings because the brown spots tend to bring out an analytical side. Sometimes they just want to feel their emotions (not have them rationalized). If you are going to get into trouble with a person with the freckled eye, it’s by holding back information. You know those people who start a sentence, “Oh, hey, I meant to tell you… Oh never mind” – well those kinds of conversations will get you directly into all kinds of trouble with the freckled eye. So where does our freckled friend find love? They could find it on line with the right weave of words from a potential partner. They will find love in any area where they can visually enjoy the other; watching them perform in sports, seeing them in the library. The thinking type will want some time to sit back and think about this individual before choosing them as the right mate. Learn more about an irigenics Eye-Print report today at the Irigenics website. Coming up? The browns, the spiritual, and the complicated; as we continue this month’s series of “Who were you born to love?” at Irigenics.com. Want to learn how to take your own eye photo? Get your free guide to taking an awesome eye selfie – HERE!